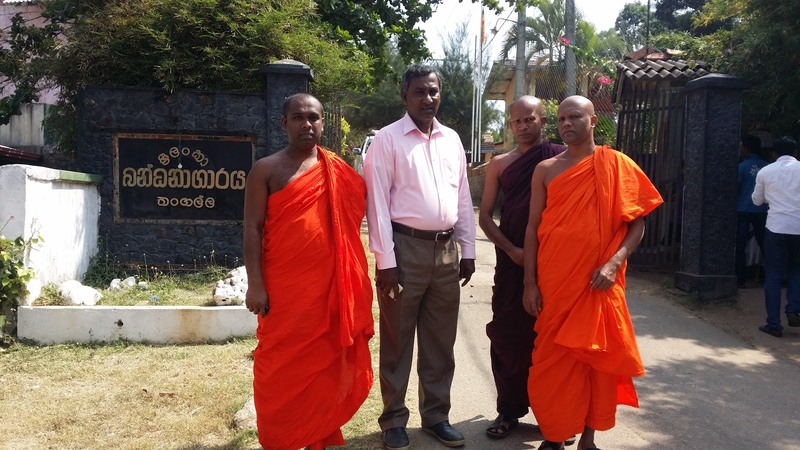 Several Bhikkus including the General Secretary of the National Bhikkhu Front (NBF) Wakamulle Uditha Thero and JVP Parliamentarian for Hambanthota District Nihal Galappaththi visited today (13th) the persons who were arrested by the police in connection with the people’s protest held at Mirijjawila in Hambanthota on the 7th and have been remanded. People protested against the government’s attempt to sell Hambanthota Harbour and hand over 15,000 acres to a Chinese company. More than 50 people were arrested and remanded for protesting against selling the Harbour and their traditional lands. Officials of Consumer Affairs Authority and Public Health Inspectors continue to raid rice mills and retail shops in Polonnaruwa District say reports. A stock of 4250 kilograms of rice unsuitable for human consumption was found in a raid carried out by Public Health Inspectors, officials of United Rice Producers Association at Polonnaruwa, officials of All Ceylon Farmers’ Federation together with police officers in Kaduruwela town on the 10th. Since then officials of Consumer Affairs Authority and Public Health Inspectors have been taking an interest in preventing rice unsuitable for human consumption from being made available for consumers and are carrying out raids on rice mills and retail shops enthusiastically say reports. National Organizer of All Ceylon Farmers’ Federation Namal Karunaratna together with Small and Large scale rice mill owners had revealed that rice unsuitable for human consumption is being prepared with chemicals to be released to the market. The Minister of Mass Media Gayantha Karunathilake using Sri Lanka Rupavahini Corporation (SLRC) has carried out a move that could take him to FCID say reports. The violation he has committed is making an illicit appointment of a person to SLRC. He has suddenly created a new post of ‘working director’ that did not exist in the Corporation and had appointed one Nuwan Somiratna, a close associate of his to the post. He doesn’t have any duty in the SLRC but has been given a large office, a staff and a vehicle from the SLRC. He has been given the vehicle KA 9650, monthly fuel allowance and Dinesh, a driver paid by the SLRC. Former Minister of Transport of Mahinda Rajapaksa regime Kumara Welgama too did a similar act by appointing his brother to a post that did not exist in Sri Lanka Transport Board (SLTB) and an investigation is being carried out regarding this misappropriation. The move by the Minister of Mass Media of the ‘yahapalana’ government is opposed by employees of SLRC say reports. A stock of 29,239,000 kilograms of ‘nadu’ rice imported by Lanka Sathosa in November, 2015 had disappeared reveal audit records. It is further revealed that the cost of the imported rice was Rs.105 a kilogram which included port charges, demurrage, electricity, labour, interest for loans obtained from banks to import the stock and other expenses. Accordingly, the value of the disappeared stock of rice is Rs. 3,079,500,000 (Rs.105 x 29,239,000 kilograms). It is significant that the disappearance had taken place just three months after the Ranil – Maithri government came to power. Details about the disapeparance is mentioned Auditor General’s report issued on a request made by the Committee On Public Enterprises (COPE). It appears on page 15 clause 4.6 to clause 15 (E) on page 59 of the audit report. 1200 dengue patients have been recorded during the first twelve days of this year state health authorities. Consultant Physician of the National Dengue Control Unit Dr. Prashila Samaraweera told media that most of the dengue patients have been reported from Colombo and Gampaha districts. She said however much programmes to eradicate dengue are carried out, eradicating dengue would not be successful as there is no proper process to remove garbage. She also said that though a number of Dengue Prevention Workshops had been conducted, the involvement of the general public for the cause remains at a bare minimum. Seventy eight persons died of dengue and more than 49,000 dengue patients had been admitted to hospitals in the year 2016. A draft necessary to formulate a national policy to eradicate dengue from the island has been compiled by a committee and it has been already handed over to the Minister said Dr. Prashila Samaraweera.